Until last month, it wasn’t clear whether U.S. President Donald Trump intended to follow through on his promises to promote dirty energy. The signs had been bad since the early days of his campaign–from bellicose claims about “bringing coal back” and intending to pull out of the Global Climate Agreement, to canceling the Clean Power Plan and opening up public lands to drilling and mining. While these actions undermine climate progress, they would be relatively easy for the next president to reverse. Even more importantly, they would not be enough to counter the fundamental economic and technological trends that are starting to put coal and nuclear power out of business. Almost all nuclear reactors and coal plants are decades old, and more and more of them simply can’t compete with newer, more efficient and cost-effective energy sources: fracked natural gas (which, unfortunately, is booming in the U.S.) and renewable energy sources like wind, solar, and energy efficiency (which are now growing more than any other sources of energy). Reality boils down to this: keeping coal and nuclear plants from closing would require both giving those two energy sources a lot more money, and blocking their competitors. And that would take a radical change to the whole way energy is priced and regulated in the U.S. and many other parts of the world. As it turns out, that is exactly what Donald Trump is proposing to do… and it’s even more extreme than most people expected. At the end of September, the U.S. Department of Energy (DOE) took action, through a little-used power under the DOE Organization Act to order a little-known but powerful agency, the Federal Energy Regulatory Commission (FERC), to radically reorganize the country’s energy markets to favor nuclear and coal. FERC regulates the interstate electricity and gas transmission systems and wholesale energy markets, as well as licensing hydropower facilities and other duties. DOE’s proposed bailout rule would cover four electricity markets in the Midwest and Northeast regions of the US, where electricity is priced and traded on wholesale markets; and it would apply to power plants that store ninety days worth of fuel on-site—in practical terms, that means nuclear reactors and coal-fired power plants. Overall, this would apply to about 104 power plants, including 43 nuclear reactors at 28 sites—nearly half of all operating reactors in the U.S. Electricity prices for those plants would be set to cover their full operating and maintenance costs, plus a guaranteed rate of return (profit) on investment in the power plant. However, not only would this guarantee the profitability of nuclear and coal power plants, it would set in motion sweeping changes in the electricity market under the false claim that wholesale power markets, regulated by FERC, are underpricing coal and nuclear plants by failing to properly value their true contributions to grid reliability. DOE also instructed FERC to fast-track the process to have the bailout in place by the end of the year—which FERC has agreed to do. DOE’s rationale for the program is not climate change, as nuclear promoters have stressed over the last few years. DOE argues that if coal and nuclear reactors continue to shut down, the power grid could fail. The move completes a 180-degree turnaround in how nuclear subsidies are being promoted and weds nuclear to coal in Trump’s dirty energy revival scheme. The nuclear industry’s claims to “carbon free emissions” (itself a telling Freudian slip) aren’t a selling point with this administration, which is of course seemingly doing everything it can to increase greenhouse gas emissions. So now the bailouts of nuclear and coal companies are all about “national security” and keeping the lights on. The DOE has been trying to cue up the bailout since April, when Energy Secretary Rick Perry ordered his staff to produce a “grid reliability” report showing that our national security is threatened by the closure of coal and nuclear power plants. Finally published in August, the report was a weak shadow of what Perry promised, failing to show that the electrical grid is threatened at all by power plant closures. Even with the biased conclusions the administration threw into it, the report found that wind and solar energy are strengthening the affordability, reliability, and resilience of the grid. 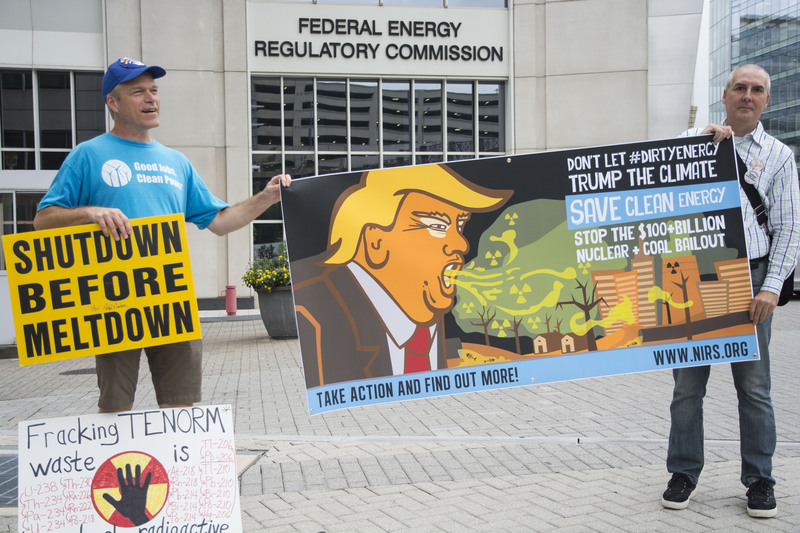 FERC would essentially “re-regulate” those coal and nuclear plants by ensuring they earn prices for their electricity that cover each reactor’s or coal plant’s operating costs, plus a significant margin of profit. That is typically set in the range of a 10% return on investment in the U.S. utility sector. Since coal and nuclear makeup about 50% of the country’s electricity supply, the bailout would totally undermine “competitive” electricity markets—leaving only natural gas plants to compete with renewables, for a possibly shrinking share of electricity sales due to energy efficiency. When DOE Secretary Perry announced the grid reliability study in April, he said the federal government may need to limit renewable energy, even to the extent of overriding state-level renewable energy laws. That may be the practical outcome of the nuclear and coal bailout proposal—even if it is not adopted in its present form. The natural gas industry is fighting the bailout right now, arguing that the bailout undermines wholesale markets, but they may be able to strike a compromise with the Trump administration. Because of the specious legal rationale and technical justification for the nuclear and coal preferences, FERC could well be forced to pass additional rules guaranteeing market preferences to natural gas plants, as well. Alternatively, FERC could reject the proposal and, instead, promote market reforms based on protecting coal, nuclear, and natural gas for reliability purposes. Regulators of the regional energy markets have already been working on plans like this, essentially to balance protecting the interests of coal, nuclear, and natural gas corporations. The result would effectively be a new energy policy in the U.S., established through energy market rather than by legislation, based on the outdated scheme of “baseload” power generation. That would severely limit the growth of renewable energy and make it impossible to reduce greenhouse gas emissions from power plants. Join NIRS in our campaign to Stop the Nuclear and Coal Bailout.